Today at lunch I flew the helicopter again and I seem to have solved all the electronics glitches. I changed from a 72Mhz RC Rx to one of the new 2.4Ghz units and it was much smoother. I'll analyze the recorded telemetry in the next day or so and post the results. This afternoon my son started hydro testing all of the vehicle tanks. We had planed to test the entire vehicle with plumbing and everything, but with recent tank failures on the test stand and our sample heat treated tank we decided to individually test the vehicle tanks. The tanks were designed to be hydroed to 500PSI. However for the 90 second vehicle we did not ned to go so high. We backed off to 450PSI and still did not fair well. We tested all 8 tanks and got the following results: Failures at 350, 385,415 and 435. Four tanks passed all the way to 455. Since thanks are welded together in pairs we have one good pair, that will go on the test stand. The rest of the vehicle tanks are probably scrap. All four tanks failed in exactly the same way, at the interface between the endcap and the tubular tank. 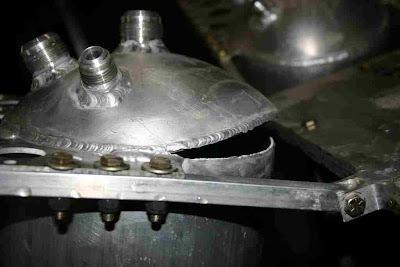 The weld stayed attached to the end cap and the weld pulled away from or failed at the tubular part of the tank. The tubular part is 6063 and the end cap 6061 so this failure mode sort of makes sense. This result really complicates the decision process. What do we have from last years effort? We have 1/4 of a vehicle tank. We have some structure. We don't have valves, plumbing electronics we can use. We think (confidence 80%) that we have motors that will work. Do we scrap the design for a simpler solution or do we fix what we know is broken? There is a strong desire to start over from scratch. If I were to start again I think I'd build a 3/4 scale pixel. However this would mean scrapping the one part we think we have working the motor. Arghhhh decisions and only 11 months to be ready. "Calm angry wife with aluminum chip in her foot by purchasing flowers"
I've decided that the lathe needs to move away from the exit door. I can do this by swapping the lathe and a work bench. So next week I need to move some power wiring and add another layer of waterproof sheet rock and or stainless steel sheeting behind the lathes new home. I'm also going to install a troll at the exit door whose job is to throw you to the ground and remove all the metal chips. If you know anyone marketing such a creature please let me know. On a slightly less serious note I flew the helicopter a number of times on Saturday and all the electronics seem to be working.I've got GPS, IMU, Ultrasonic altitude sensor, compass, RC receiver,telemetry transceiver and netburner cpu all running on an electric Trex 600. I finally solved the GPS problem by moving it to the end of the tail boom. It is all functional, with the current setup the RC receiver is hooked to the CPU and the servos are all driven by the CPU. Right now the CPU just echoes the RC receiver commands and the vehicle is flown manually, but it proves out all the hardware. These tests included the ground telemetry box and RF to Ethernet translator I was showing at the xprize cup. There were a bunch of guys at FAR for a solid motor class and one of them captured me flying the helicopter. We originally hydroed one tank to failure. It failed at 495 PSI. We made the end cap that failed thicker, and assumed we fixed the problem. Today I asked my son to hydro the test stand to 500 PSI since we had not done so. The first tank in the test stand failed at 475. He then hydro tested the tank we had heat treated. It failed at 425. So to complete the set we tested the other tank on the test stand to failure it failed at 560PSI. All three failed in exactly the same spot in the weld between the end cap and tank end. Its clear that our quality control needs some work. On Tuesday we will hydro all 8 tanks on the actual vehicle and see how that goes. Its really hard to tell if the failure is in the heat effected zone on the margin next to the weld, or if the welds them selves are too thin. Its an effort to buy plane tickets for enlisted men and women to allow them to fly home for the holidays. Its an all volunteer's effort last year they spent 96% of what was donated on the troops. This is the one and only time of the year I'll post a request on the blog. We started this project last year looking for light weight actuators. We assumed that we could just use off the shelf ball valves. Buttery fly valve we were using as a throttling vale as the only valve. Failed Leaking, very very non-linear. All rotating seals failed at Ln2 Temperatures. Worked, sealed and had signiifcantly more hysteresis at LN2 temps than at room temperature. This is my "Simple" custom valve idea. 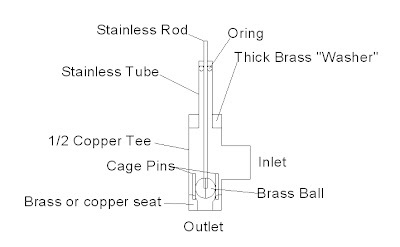 I build a small linear valve in a copper plumbing tee. Making cryogenic seals work is hard, so I cheat. I add some heat to the end of the thin wall stainless to keep the seal end warm. The force necessary to operate this valve is within the range of the small fast robot servos I've been using. the valve is operated by pulling the stainless rod in and out. The Cage pins are there to make the ball stay in place. I'm concerned that the flow will make the ball chatter. If the seals give me trouble I can go to an electroformed bellows. Why not put your rocket engine on top so the vehicle will be naturally stable. This is wrong. It jives with our natural experience of the world, but it is wrong. A rocket has no natural preference for thrusting UP. The rocket will thrust in whatever direction you point it. This is unusual in out natural experience. It you hang something on a rope the rope has the natural tendency to dangle straight down and only apply force in the up direction. If you attach something to a balloon the balloon only pulls straight up. So given that the rocket will thrust in whatever direction its pointed and has no natural tendency to point up the rocket can't add any stability. Our intuition is not completely wrong with respect to where the rocket motor goes, if it's center of thrust is not pointing through the center of mass then the rocket engine will apply a torque and the vehicle will spin. The current unreasonable rocket design has four engines that must be balanced to keep the vehicle from spinning, so in this sense a single rocket motor pointing toward the center of mass would keep the rocket pointed in a constant direction, but that direction would not be preferentially up without some kind of external control. The Agony of the valves. After spending a few days at XPC it's very clear that our system is too complex. KISS Keep It Simple Stupid. The temptation is very great to start over from scratch and redesign everything. If I were to start again I would design something that looks a lot like pixel or the Armadillo Quad, a Single engine. The counter to this is that the only thing we really need to finish our vehicle is fast robust reliable valves. Its always tempting to trade the devil you know for the invisible devil lying in the green grass on the other side of the fence. Everyone I've talked to in Alt space has had valve problems of one kind or another. My core problem is that I need very fast (50 to 100msec) control of the engine thrust to maintain reliable attitude control. Our vehicle is relatively small so that it's overall rotational inertia is low, and the motors are on the very outside of the vehicle this combines to require fast/precise control of the motor thrust. We can do some freshman physics and figure that out. Lets assume that the vehicle is 2m diameter sphere. The motors are thrusting on a 1 meter lever arm from the Cg. Now assume we can very the thrust in 1% steps around nominal. If we want 1 degree control of the vehicle 1 degree = 0.01745 radians. So for 1% motor change a 1 degree error occurs in t=.53 seconds. We would like our control to be about 5x to 10x the speed hence we need a 50msec valve. Monster actuators and normal ball valves. Lots of hysteresis (3 to 5%), Seals wear out quickly. Hysteresis really complicates the control system. Voice coil driven piloted spool valves. Such things exist for Hydraulic systems. Hysteresis 0.1% Basically a perfect valve. Serious engineering effort to build such a valve in a Lox compatible way. Modulating just the fuel supply while leaving the LOX on a slow actuator. One fast Solenoid valve as trim with Slow ball valve following. Potentially the lowest cost option. Requires a lot of development testing. I'm sure I'll post more on this in the coming days and weeks.